I connected with an old friend today. No it wasn't sugar. We are still not speaking. Someone who tries to follow a very alkaline diet. So lots of veggies and no processed foods. 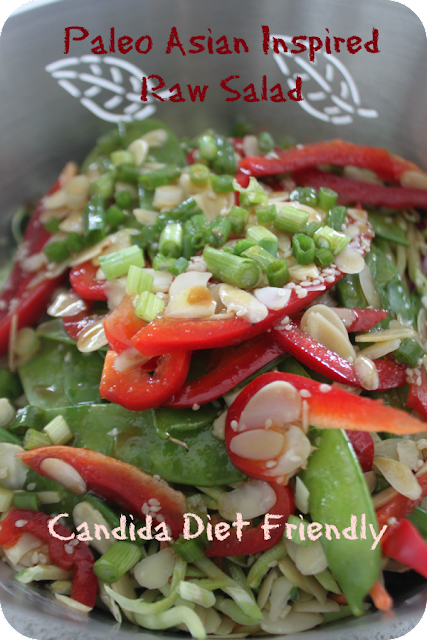 So I challenged myself to make us a "raw" lunch that was both Candida diet friendly, alkaline and tasty. I have been struggling a bit on this Candida diet with making a salad dressing that tasted really good. Well I happened to find two ingredients at my local health food store that are Candida diet friendly - i.e. no sugar, vinegar or yeast - that made this happen. Coconut vinegar and coconut amino's to the rescue. Yay. I had originally thought apple cider vinegar and Bragg's liquid amino's were the answer but upon further research they are not the best alternative for my Candida issue. So if you can get your hands on coconut vinegar and amino's - do it. A bit expensive at about $6 for a smallish bottle but when you mix it with EVOO you can stretch it a long way. So here is a delicious recipe that was shared with a delightful friend. Make it for someone you care about - because we can all benefit from getting a little alkaline this weekend. We also sprinkled some hemp hearts on top to give it a protein boost - that's up to you. Just toss all this together. Combine all dressing ingredients together. Shake well and pour over Asian salad. Serve & Enjoy.